I can answer that it’s a lot like America but with different healthcare, and you press 2 for French instead of for Spanish. Or that it’s cold in the winter – sorry about that, eh? I can tell you that we celebrate Thanksgiving in October and we’ve got the Queen on our money. All of that is true. But it’s not the whole story, at least not for me. Canada is my history. I grew up there and it will always be an important part of who I am and how I think. Canada is my memories. Canada is a Tim Hortons coffee warming my hands through my gloves. It’s biting into a toasted and buttered Saint-Viateur bagel and getting sesame seeds stuck in my braces. It’s braving the Drummond ice sheets to get to my classes at the Stewart Biology buildings. It’s breakfast Chez Cora and a pint at Hurley’s. It’s “sorry” and it’s “câlisse.” It’s the green line and the orange line and the three note salute from the trains as they pull away. It’s potholes and orange cones and jerks speeding down Decarie in souped-up Civics. It’s Christmas lights on McGill College Avenue and the world’s greatest fireworks all summer long at LaRonde. Canada is my genes and my soul. It’s Grandmaman and Matante Gigi trash-talking each other over dice games. It’s Momo’s big house with the lions out front. It’s my parents and siblings and aunts and great-aunts and cousins. It’s emphatic French cursing and hand-waving and hugging. It’s my opinions and my voice, grown from twenty-five of my most malleable years, living in the Great White North. It’s my history. It’s my heart. It’s my home. I miss you, Canada. Happy birthday. This entry was posted in Life and Family, Thoughts & Opinions and tagged Canada, homesick on July 1, 2013 by antijen. When a building is integral to the story of a place, sometimes government steps in and protects it from the forces of progress and change by calling it a heritage site. The home in Salzburg where Mozart was born. The Old North Church in Boston where furtive lanterns warned patriots that the British were coming. Tear down those buildings, and the towns don’t just suffer a loss of tourist money. Losing heritage sites is like losing history, diluting identity. You don’t have to be a country, or even a city, to have a heritage sites. Everyone has places that played an important part in their lives, their histories. A childhood home where that one cabinet door never closed right. A corner store where allowances were spent on gummy worms. A park where someone knelt and offered a ring. Any place whose destruction you would mourn, because you could never share it with your children, is a personal heritage site for you. I’d like to share one of mine. 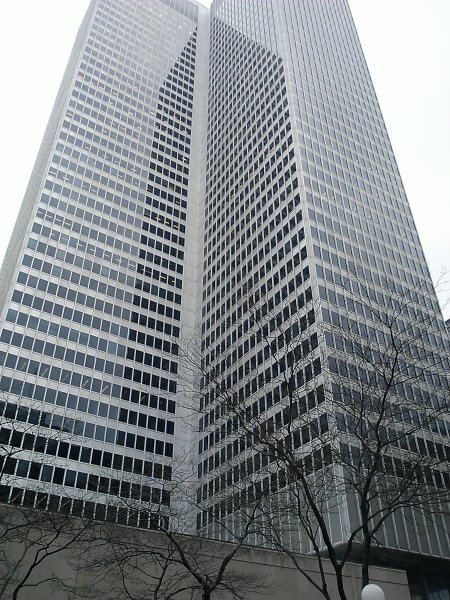 Place Ville Marie is an office building at the heart of downtown Montreal. It’s 47 stories of steel and sparkling glass, making an cross shape distinctive enough to earn it a place on postcards. A spotlight spins around on its summit after dark, sending out a bright white beam for miles. At the heart of the cross, a dozen elevators whoosh up and down at an alarming speed, popping ears and making riders reach for something to hang on to. Downstairs, beneath the atrium where the sounds of high heels and conversations echo off the marble walls, is a shopping mall connecting it to Montreal’s underground city. Outside, between the main building and one of its small satellites, is a courtyard with trees and slick grey granite. Every warm sunny day, it’s filled with suits and their to-go lunches from the food court. That courtyard is my heritage place. I visited often enough during my suburban high school and CEGEP years, but once I found myself on the McGill University campus every day, I became a regular. Between classes, or before leaving for home, I’d come and sit on the granite ledges, alternating between reading a book and watching the water play on the green statue in the fountain. Sometimes I’d throw a penny into the fountain as I passed, although I can’t say that fountain was any better at delivering on wishes than any other. When the weather got too cold for me to sit on the stone, I’d stand at the railing overlooking McGill College Avenue, a double-double warming my hands through my gloves, and take in the sparkling Christmas lights and the scarf-wrapped crowds. The view is beautiful from that spot. 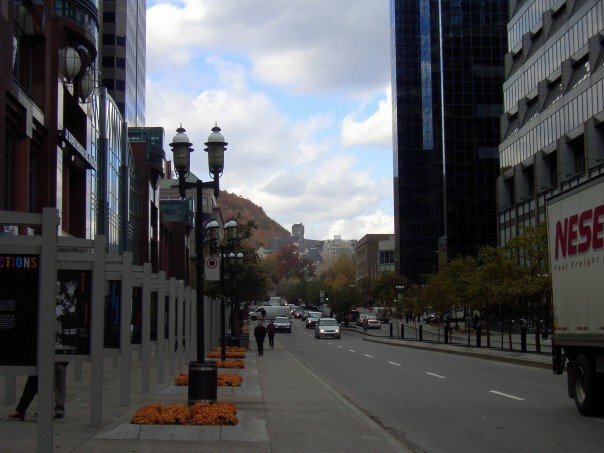 McGill College Avenue, wide and tree-lined, stretches out from Place Ville Marie up to McGill’s Roddick Gates and the campus beyond. Behind the university’s old stone buildings, Mount Royal looms, its colors shifting over the seasons. 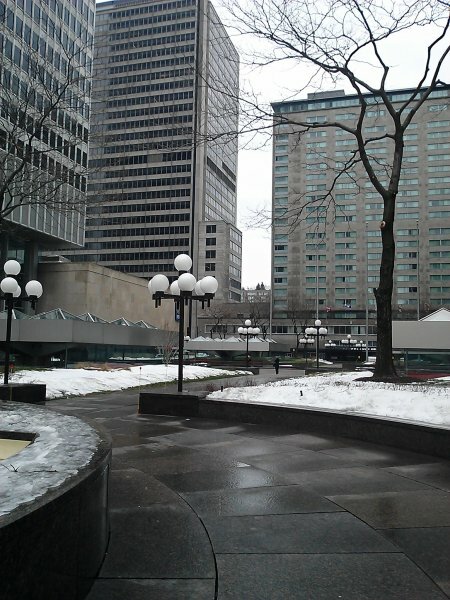 I made sure to bring my husband here when he visited Montreal, to show him this little place that means so much to me. I miss that courtyard dearly, and I always try to return when I’m in town over a weekend. I stay just long enough to throw a penny into the fountain, sip a coffee, and enjoy the sound of my city. This entry was posted in Thoughts & Opinions and tagged Canada, homesick, part of our heritage on May 9, 2013 by antijen. We needed this cruise. More than I realized; more than I can really explain. Different couples deal with stress in different ways. Some argue, slam doors, and seek out space away from one another. Some look so far outside the relationship for comfort or for escape that nothing can be salvaged. I have always been afraid that stress would pull my relationships apart. My family doesn’t have a good record in that area. Almost every one of my aunts and uncles who married found themselves in a hurtful and bitter divorce. My parents’ relationship was strained and uncomfortable for years, and ended the same way. My first boyfriend abandoned me when my parents’ divorce made me “too goddamn sad all the time” and “annoying to be around.” I see now that it was an unstable and unhealthy young-adult relationship that was a bad idea from the start, but it crushed my 18-year-old self. I dropped out of college and floated through several months in a blur before finding the light again and crawling my way towards it. I went back to school. I tried to be sociable. But things were different. I had witnessed a relationship I thought was the most solid and reliable one in the whole world – my parents’ marriage – falling angrily apart in front of me. I had no good role models, nobody to look to for thoughts on a healthy relationship except the columnists at Cosmo and the couples on Friends. When my husband and I were moving towards our wedding day, I was flooded with conflicting thoughts. Of course we’d last forever – we loved each other so much, understood each other so well, laughed so often together. But everyone must think that at one time, or nobody would ever risk the commitment of marriage. Who could say, then, whether our relationship could withstand all the years ahead, all the problems that would come our way? It’s been a hard year for us. Members of my family, far away in Canada, have been sick and needing surgery. I lost one grandmother, and the other is 98 and fading. I’m far away and can’t be there for the ones I love, and the guilt eats away at me. I left my old job, which meant leaving some of my support group behind. Other friends moved away. I’m still striving to find my role in my career and in this world. Arguing with immigration agents. Arguing with health insurance companies. Struggles and loss. I got scared. Scared for us. I tell my husband, often, how much I love him. I cling to him sometimes when we’re in our office together. I drape my arms over his shoulders, my cheek pressed into his beard, as he reads message boards and checks his email. I doubt. I worry, analyzing everything. I ask him again and again whether we’ll be okay, whether we’ll stick together, all the while hating myself for asking but not always able to stop. His answers are always the same, always reassuring, always patient, always yes, yes, of course, I love you and we’re in this for the long haul no matter what. “How Did We Get From Saying ‘I Love You'”, by Great Big Sea, is a breakup song. It’s about running into your ex after the breakup and realizing you can’t find anything in common anymore, anything to talk about except the smalltalk of strangers. It’s heartbreakingly sad. My feelings of inadequacy and fear of divorce and loneliness make a song like this really resonate with me. And my husband played this song for me, at an open mic night on our cruise. Knowing how much I love hearing him play music, my husband found a way to dedicate his performance to me without dedicating the song itself. A little gesture, spontaneous, touching. It meant so much. Maybe we’ve come from saying “I Love You” to the place where the words don’t matter as much as the sentiment, and maybe I can be okay with that. I am loved. I’m linking up with some amazing bloggers over at Yeah Write. Stop by and spend a little time reading and supporting the gang! This entry was posted in Life and Family and tagged family, Great Big Sea, homesick, spousal silliness on March 6, 2013 by antijen. Say those words to any Canadian in their thirties, and they will either mime a frantic telegraph operator or tell you they smell burnt toast. No, we’re not all insane. Years ago, when my age cohort was young and impressionable, a series of short films were aired on TV alongside commercials for Skip-Its and Ninja Turtle figurines. These “Heritage Minutes” were sponsored by various corporations over the years and were aired on Canadian TV networks as a way to increase the amount of Canadian content we were exposed to. Thus we learned about Doctor Wilder Penfield, pioneer in neurosurgery and mapper of the brain, first director of McGill University’s Montreal Neurological Institute. We learned about the Halifax Explosion of 1917, where a ship loaded with explosives caught fire in the harbour after a collision. The disaster would have claimed more lives than it did had it not been for the sacrifice of Vince Coleman, a telegraph operator who stayed at his post to warn incoming trains of the danger. While we absorbed Saturday morning cartoons, we learned of hockey heroes, war heroes, inventors and pioneers, all Canadian, all a part of our shared heritage. Those short films have stayed with me for decades now, snippets of them playing in my head, their words waiting on my tongue. I looked these videos up today because it occurred to me that I’ve forgotten much of my Canadian history. I will need to study American history if I am to pass the citizenship test next year, but much of the Canadian history I learned as a child is beginning to fade. I remember Jacques Cartier and Samuel de Champlain. At least, I remember their names. I remember the Iroquois and their longhouses. I remember Vimy Ridge, and the bright poppy fields of Flanders. But I can’t remember the story. I can’t explain anymore what Canada is, where it came from, how it changed and grew. I am forgetting my heritage. If you would like to watch more of these videos, and I recommend that you do, there is a playlist of all of them on Youtube here. This entry was posted in Thoughts & Opinions and tagged Canada, Dr. Penfield, heritage minutes, homesick, part of our heritage on January 19, 2013 by antijen. I cook like my mother. I rarely measure anything out, even though I have lovely sets of measuring cups and spoons and am always tempted to buy more when I pass by Pier 1 Imports or Williams Sonoma. I come from a “pinch of this” and “dash of that” heritage. When it was time to learn the secrets of spaghetti sauce, I stood beside the stove and watched my mother pour spices into her cupped palm until the piles of crushed leaves looked big enough to add to the simmering pot. She instructed me on proper measurements: “Cup your palm tighter for the thyme, you only want a small handful.” I’m very lucky: our hands are the same. Her recipes are frustrating, because they include measurements like a “a squirt” and directions like “until it’s the right consistency.” Unless you’ve watched the process all the way through a few times, it’s difficult to do her dishes justice on your own. But I watched. I watched for years. I pinched pie crusts between my fingers and I dripped sauces off the back of a spoon. I learned. My spaghetti sauce is nothing like hers, now. But it’s incredible. A consequence of this learning method is that no recipe is safe with me. I intend to follow recipes – really, I do – but sometimes I only have boneless chicken breasts instead of the bone-in-thighs that the recipe calls for, and the substitutions start. I’ll use cheddar if I don’t have Monterey Jack. I’ll toss in skim milk because it’s probably a better substitute for cream than my Bailey’s Toffee Almond coffee creamer. I’ll automatically double the garlic content of any recipe I’m following. Of course, the biggest drawback to the substitution game is that I never make exactly the same recipe twice. When someone loves what I’ve made for dinner and asks me for the recipe, I can lend them the book or forward them a website link, but the version they’ll make will never be quite right. I try to explain what I did differently, but sometimes I don’t even know. I added more honey to sweeten the glaze, but I couldn’t tell you exactly how much, because I flipped the honey bear over and squeezed him until it tasted right. I kept adding chicken stock to thin the soup, but I didn’t keep track of how much more I needed. I’ve considered being more scientific about the process and trying to write down what I’m doing as I go. I should probably add the honey by teaspoons, not blobs, and I should pour the broth from a measuring cup instead of the box, so I can see how much I have left and do the math. But although I consider myself a scientist, I just can’t seem to bring a calculating mentality into my kitchen. My meals are art. Not always good art, mind you, but it’s a creative process more than a formula, and I don’t know that I can change it. I don’t think I want to. I’d love to cook for you. I have so much fun experimenting in the kitchen, and it’s wonderful to share the results with friends. I promise to do my best to give you an accurate recipe if you ask for it, but unless you’ve been hanging out with me in my kitchen and watching me work, you need to take those recipes with a grain of salt. Maybe two grains. I’m not sure, exactly. Stop when it tastes right. Linking up with bloggers who write and writers who blog over at Yeah Write. Pop on over there and read some other great stuff. 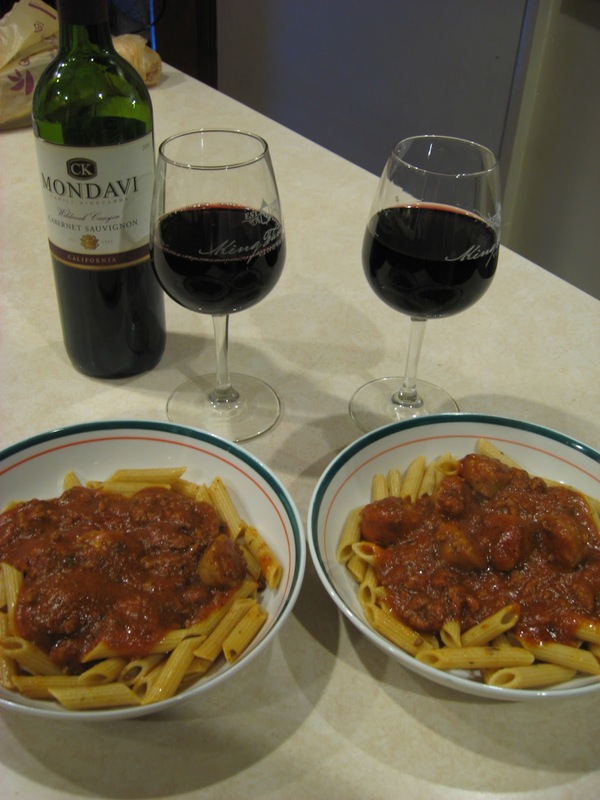 This entry was posted in Food, Life and Family and tagged family, homesick, spaghetti, traditions on January 14, 2013 by antijen.